Catch some pleasant dreams with this delightful and dazzling quilt set. Soft, wind-swirl quilted material will hold up to years of use, lending a lightweight comfort that is well suited to any climate. The reversible design on the quilt offers marvelous versatility, allowing you to switch up your bedroom decor in an instant. I have 3 Greenhaven quilt sets now and really like them. They are soft, lightweight, colorful; very nice. This one is described as being "oversized"; I order the Full/Queen for my Queen bed-thought about ordering a King size to ensure full coverage but I didn't want to have King size shams. Kind of wish I had because this size just fits from top to bottom, just barely covering end of mattress before the bedskirt. I really love this pattern, DH is of Native American heritage and this room is decorated with dream catchers, native sayings, portraits, etc. Just wish it had truly been "oversized". I like it, will keep it but it isn't as nice looking on the bed as my other ones. Seems to be a sturdy all-season quilt and the lovely colors go well with a piece of art we already had in the room. Covers queen mattress with a couple of inches to spare. Background is a true white. 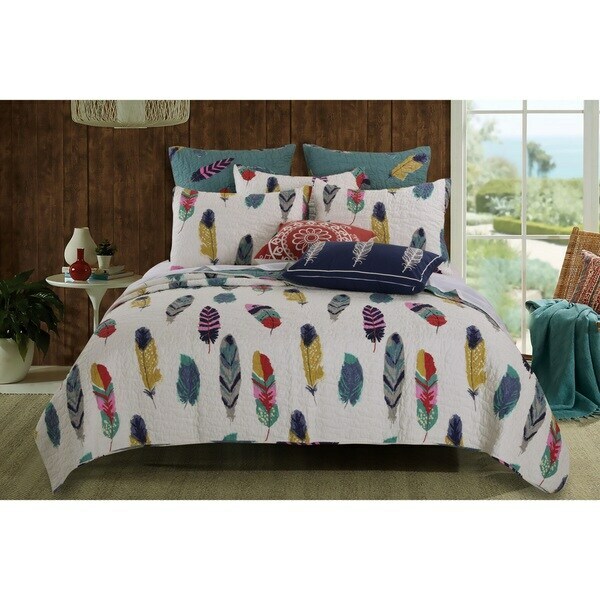 I purchased 3-piece “Dream Catcher Teal” quilt set for a guest room along with the reversible quilt, shams and curtains from Overstock, colors are brilliant and very well made. Love, love, love this set and would purchase it again. The fun print and color of this quilt are great, the colors are true to the photograph, and having the print on both sides is a great idea to mix things up. The quality of the fabric however does leave something to be desired. If you look at the details, it is not a fully cotton quilt, wish I had noticed that, because the feel of the quilt is not really what I expected, there is that synthetic feel. However since I am using this in a guest room as an addition to a duvet, this isn't too much of an issue, but will be paying closer attention to the fabric content in the future. Extremely happy with this quilt set! I actually bought 2 for my children's room. The colors bright and quality is spectacular because I have bought other quilts in the past and they rip easily. Two thumbs up! The material is soft and the stitching is well-done. The pillowcases close in center back with ties. The back of the pillow cases are the blue background. Love the material of this quilt set and it seems to be made really well. The colors are amazing too. I would recommend this product and buy it again. This beautiful quilt is a great product. Not to heavy, great for Texas. The colors are true to the website. The matching quilted shams are a perfect finishing touch. I get lots of complements on this product. I love the quality and look of this set. It is exactly as pictured and has the prettiest hand. My only regret with it is it is not 100% cotton (has 30% polyester) which makes it retain heat somewhat. Will use it as a bedspread more than a sleeping quilt but it is very attractive and provides just the right decorative effect I was going for in the master bedroom. I bought this quilt for a “couch blanket” since most throws aren’t big enough. This is perfect size. I have to launder often as I share it with 2 dogs, and it’s held up great. Very good looking, as well. I would recommend this quilt. Bought for pre-teen granddaughter's room (Native American theme) when she upgraded to a queen-sized bed. Colors very vibrant - looks just like the photos in the ad and an excellent value. Covered the bed perfectly and she loves the softness. Purchased for my daughter , she loved it! She loves boho and dream catchers. Looked great in her first apartment in college. Nice quilt, easy to make bed and light weight. I purchased this to go with a "bird/feather" theme in a guest room. This sizing is better suited for a full-size bed as it barely provides enough length on the sides and falls short top-to-bottom IMO. The front is polyester and back is a cotton and has started to pill just a little, but over many, many washings. I really like the print, just wish it was larger. I Loved it even more when i got it. Than i thought i would. It Keeps you very warm all through the year, love the color and the material. It worked perfect in the room i needed it for. Precious Bold Colors!! Great quality! Just what I was looking for!! Thank you, Overstock! And I love adding reviews for $$ credit! Wonderful idea! It is a cotton/polyester blend. "Hello, What is wind-swirl quilting? Is it done by hand or machine? Also are the shams reversible like the quilt? A reviewer said they aren't but another customer answered a question on 0104 stating the opposite. Most are with the quilt sets.. so confused again. :) Thanks!" Hi, I believe the quilting is done by machine. I purchased the full/queen set , and the pillow shams I received were not reversible. I also read the review stating shams were reversible. The shams I received were not . Thanks Lucy B. Thats interesting about the shams... will have to give the set more thought. I've read a lot about quilts over the years and had not heard of wind-swirl quilting. I always learn something new. :) Thanks again! "How do I get all of the decorative pillows that match?" I got 1 reversible pillow sham with my twin quilt and 2 reversible shams with my king quilt. I do not know where you can buy the dark blue pillow with the white feathers. "Does it come in full/queen"
Yes, I purchased full queen. "In the photo the back round looks white ( which I hope it is), yet the description states ivory?" The background is ivory. If you lay a stark white shirt on it, you can see that it is ivory. However, I have all white trim and white wood window blinds and I can hardly notice that it is a bit ivory in color. I liked the colors and theme. My daughter loves dream catchers and this was the closest, beautiful, related quilt. I prefer quilts to comforters! Haven't received it yet, but hoping to love it!